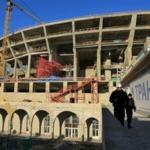 St. Petersburg authorities said the competition on completion of the stadium «Zenit arena», which is being built in the Western part of Krestovsky island to the world football championship 2018. The maximum amount of the contract will be 9, 14 billion rubles, it follows from the documents published on the Internet office of procurement. As reported by the first Vice-Governor of Marat Oganesyan, this amount is included in the overall estimate 34, 9 billion, approved by the state expertise. the scope of works included, for example, the development roll-out of the field and retractable roof, as well as parts of engineering communications. The proposed stadium is laid in the Western part of Krestovsky island in 2007. His project was amended three times: in 2008, 2010 and 2013. Every time the cost of the arena was increased from anticipated at the beginning of 6, 7 billion rubles To possible 43, 8 billion rubles — this amount mentioned «before sunset» in the penultimate examination. However, the chamber was required to reduce it to 35 billion rubles, abandoning non-core areas. Final technical and construction part of the project were approved in 2014. The total cost of the arena was 34, 9 billion rubles General contractor of the object is «ETS» (included in «Transstroy» Oleg Deripaska).